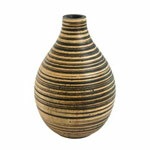 The talented Thai artisans hand-craft this vase from sustainable mango wood. The foot widens out into a large body and gradually collapse into a narrow mouth. The artisans lathe and stain parallel lines round the light-colored body. A lovely adornment for any interior. The finish used for this vase is not watertight, and thus the piece is not meant to be filled with water. Ideal for use displaying dry flowers. 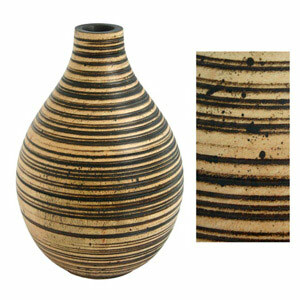 Size: 18.0 cm Diam x 25.0 cm H.
This vase is handcrafted by artisans in a large workshop located in Chiang Mai, Thailand.